An ancestral method red sparkler made from a field blend of Marquette, Saint Croix, La Crescent, Frontenac Gris, Frontenac Blanc, and Frontenac Noir. Co-fermented with indigenous yeasts. Unfiltered and unfined. No added sulphur. 11.5% ABV. 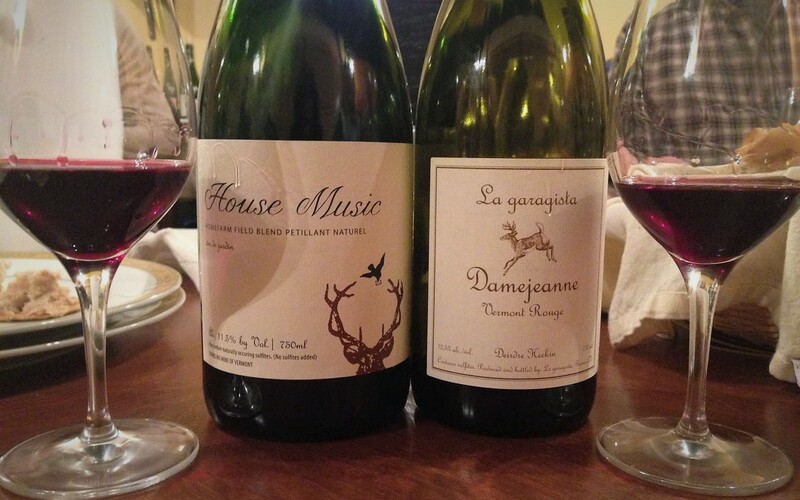 Quebec agent: Les Vins Dame-Jeanne. Damejeannes are better known in English as demijohns or carboys, the glass vessels most of La Garagista’s wines are fermented and sometimes matured in. This is a blend of Marquette (90%) and La Crescent (10%). Fermented on the skins with indigenous yeasts, matured one year. Unfiltered and unfined. No added sulphur. 12.5% ABV. Quebec agent: Les Vins Dame-Jeanne. Whatever else the assembled tasters thought about the La Garagista wines, everyone agreed they had an energy and a vibrancy – a closeness to the fruit and terroir – that are rare for any wine, let alone ones made from hybrid grapes grown in a harsh climate. The buzz around the table in the tasting room and the Vins Dame-Jeanne booth at the Salon des Quilles was palpable. People, myself included, were stoked about the wines themselves but also about realizing that truly exciting wines unlike any others can be made in our part of the world. Quebec vintners should take note.